‘Mobil-Eyes Us’ uses the power of live video to connect you to the causes you care about, and provides meaningful ways that you can act by doing what you do best. Mobil-Eyes Us is a project currently being incubated at WITNESS that aims to combine three disruptive technologies and the power of distributed, decentralized networks in the service of better social good engagement and activism: live video streaming (think Periscope, Meerkat, Bambuser and others ), task-routing for under-utilized capacity within distributed networks of people (think Uber and other tools of the ‘sharing economy’) and opportunity match-making on your phone (think Tinder). We know that millions of people globally take actions for issues they care about — but frequently their only option is a click to donate or sign a petition. Often they don’t feel connected to the issues or the actions -and usually the available actions are also not a good use of their skills, leverage or capacity. What if we could create a ‘witnessing’ corps of people ready to tune in live? What if, using live video, we could bring supporters into a human rights or other social justice situation at the right time to fully experience the reality? And then ask them to use their unique skills, leverage, or networks to take action — for example, to deter illegal violence by their group presence, to rapidly share video material or invite others to act as well, or to provide direct legal guidance? Through an effective integration of technologies with storytelling and movement-building, we are building out prototypes (more on this below) to help people feel more experientially connected to causes they care about and then take actions that matter. In a world saturated with clicktivism and calls-to-action, the ability to create connections, to deeply convey the impact of human rights and humanitarian catastrophe, to build deep, walk-in-their-shoes empathy for victims, and to inspire and facilitate meaningful, personal action, still eludes much activism for social good. 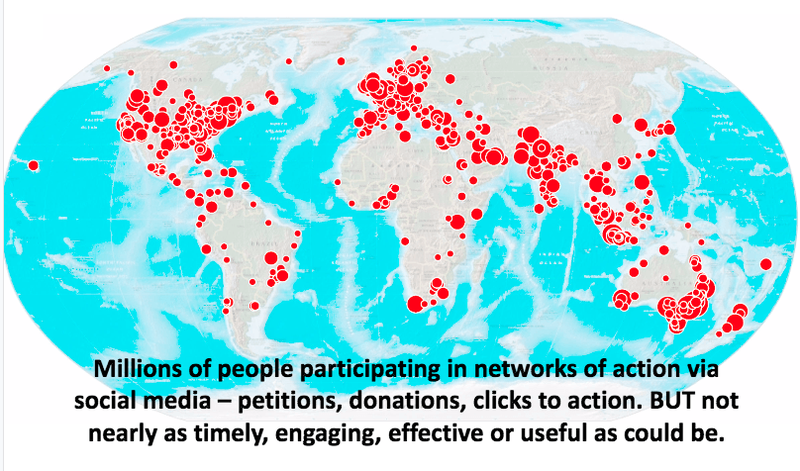 Make far better use of the distributed networks of people who would like to act for social good, but are unable to see an action now that is more than clicktivism. 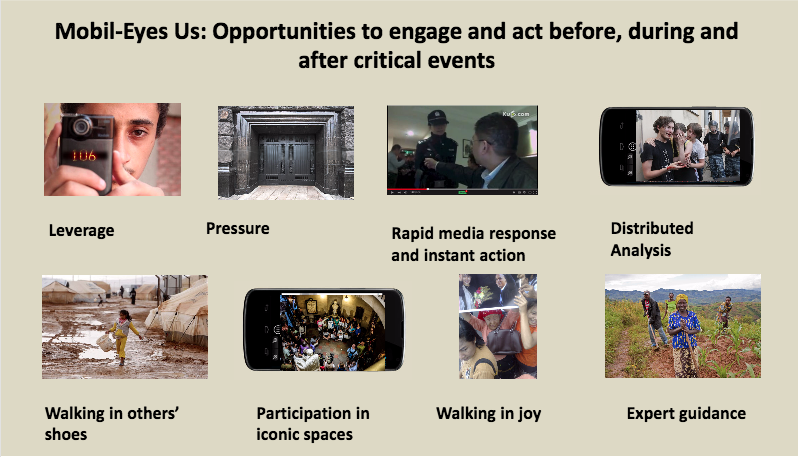 Use emerging live and immersive experience technologies to help distributed networks of people to care and better empathize with people facing risk and demonstrating courage in challenging human rights and humanitarian situations. Use experiences and tech from the task-routing and sharing economy to translate engagement into actions that meaningfully use each watching individual’s skills, leverage, and networks, their capacity at the right time in their schedule, for purposes that actually make a timely difference on the ground. Groups like Amnesty International have in excess of seven million members worldwide, who are often involved in taking symbolic or mass actions. With a more effective way to engage people, use latent capacity, and secure meaningful action, not only could the millions of people who are actively concern for human rights and humanitarian action be engaged, but so could millions more. We could engage those who currently turn away from action because they cannot understand, do not care, or cannot conceive of an effective action that they can take on a personal level. Opportunities to ‘walk in someone’s shoes’ and then amplify their demands and needs (for example in the current refugee crisis in Europe) via both social media and the mainstream media. Virtual representation of a number of remote participants on-site where frontliners are, in order to exert pressure or leverage. Remote monitoring support and/or legal observation to provide protection and rapid response for frontliners at risk. Discrete services and support, such as rapid editing of video to increase the reach of a protest or other action. Crowd-based analysis of events as they happen. For a more detailed background on the potential tactics within this approach see this post and this research Tumblr. We plan to create an interface based upon existing tools that allows ‘supporters’ to indicate issues they care about, skills they have and (eventually) connect this to their smart calendaring (examples of smart calendar apps are available here). ‘Frontliners’ then provide planned and spontaneous opportunities to join live experiences from the sites of social activism and crisis, combined with meaningful asks for action to support them. ‘Supporters’ are notified of an opportunity only if it correlates with their skills, availability, and interests (based on match-making tools): e.g. a frontliner asks “I need 100 people to join me right now to help provide watching eyes in my community under threat”, or to watch and then generate attention on social media; or super-activists participate in opportunities to feel what it’s like to be in a Syrian refugee camp, and then translate that into fundraising; or an individual e.g. a lawyer or a video editor provides instant specialized expertise at the right time and place. We are currently exploring scenarios in which to test out these concepts with groups on the ground who are looking at how to mobilize their existing or potential support networks for greater impact. Allowing activists to give distant witnesses a physical presence during an action makes their participation that much more powerful, and it also provides those frontline activists with more leverage and protection. A group of a dozen activists in an isolated location can seem vulnerable; two people in a meeting with a decision-maker can feel weak, but their cause is bolstered if they can show dozens, hundreds, or thousands more watching and participating digitally. Livestreaming has long been an asset for activists wanting to share their realities with the world, but now the rest of the world can have their presence represented. Our initial prototype simply queries a live stream API to grab the viewer count and provide a link that can be displayed on phones or tablets to represent the people who are co-present via live stream. Live video allows remote viewers to see the action in real time, but their options for taking action and being involved are essentially limited to the comments and likes they’re about to submit. We need new tools that allow those viewers to take meaningful action. The workflow we’ve developed here is a first step in that process — it allows distant witnesses to indicate what skills they can contribute and how they’d like to engage. And frontline activists can alert the right supporter at the right time and bring them into the action via live video. For example, an activist can alert a qualified legal observer to a forced eviction as it happens, allowing the observer to log-on, watch, and provide a firsthand response in real time. The Assembled Action workflow is a combination of existing tools (Meerkat, Twitter, IFTT (If This Then That), Google Calendar) that can be strung together to create a targeted alert system. The goal is to allow frontline activists to combine task-routing, calendars, and live video to contact and mobilize (or activate) supporters based on their skill sets, and to then schedule their participation with the click of a button. Contact us via email (sam_at_witness.org) or via Twitter @samgregory. Featured image via Osvaldo Gago. Originally published at blog.witness.org on October 12, 2015.